This may conjure up thoughts of pushy salespeople doing anything to get a sale, even if the person they’re selling to doesn’t want or need it. But, in reality, the quote was meant to communicate something different. It’s about the control that salespeople have over their own fate. Their success is depends on their own attitude--their skills, experience, and drive. What this means is that who is selling is often times much more important than what they’re selling. And for startups, having the right person selling can mean the difference between life and death for the company. 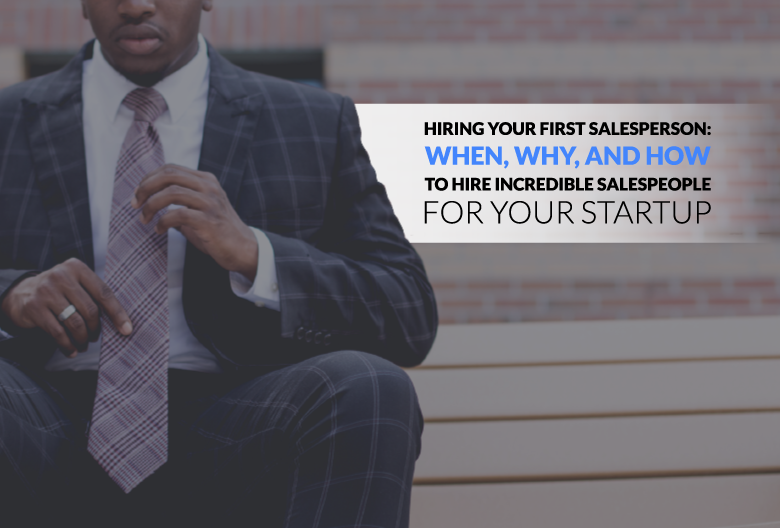 As a startup founder, the time will come where you need to hire your first salesperson. Now this can be scary. First of all, you’ve likely never hired a salesperson before--what do you even look for? Secondly, your first salesperson will be responsible for the core revenue generating activity for your entire company. In other words, you need someone who you can fully trust to help grow your business. 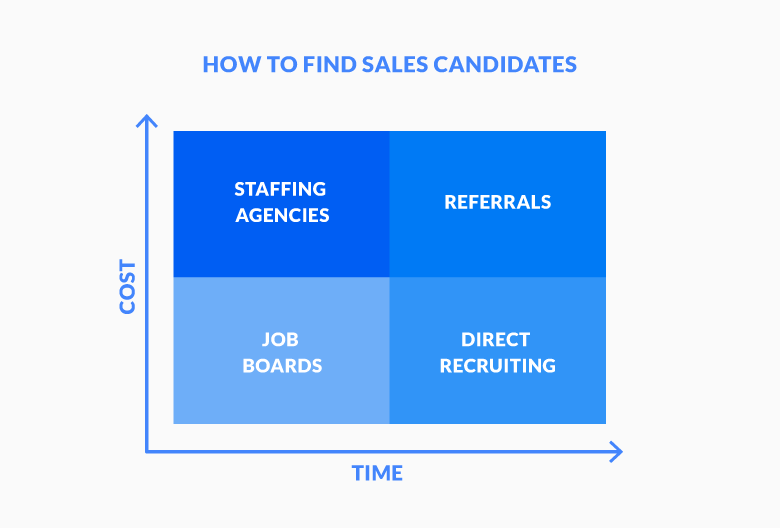 This guide explains how you should go about making that all-important first sales hire: when you should hire someone, where to look for the right talent, how to screen and interview, and how you can close the deal with the right candidate. Pretty much every successful startup has one thing in common: the first salesperson is one of the founders of the company. This is such a critical step in the sales process because it gives the owner(s) of the company a chance to really go out in the trenches, talk to customers, learn about the objections, face failure, and improve the product or service. As a founder, you might be a natural salesperson or you might hate sales. But this is a valuable learning experience and you shouldn’t rush too hastily to “outsource” the selling to someone else. Don’t run out to hire a salesperson right away. Instead, focus on learning from the experience. Get a feeling for what it’s like to sell to your customers so that you can later define who you need to hire in order for them to be successful. On the other hand, some startups wait too long to hire a salesperson. The founders are drowning, wearing too many hats, and dropping balls left and right before they realize that they need to offload some of their work in order to grow. When you hire your first salesperson can be almost (but probably not quite) as important as who you end up hiring. So, when should you make this transition? Some experts advise that founders should make at least 10 sales before hiring their first salesperson, but that number will depend on the type and size of the deals. Before you begin looking for the right candidate, you need to define what the right candidate looks like. Your candidate profile is like a checklist of characteristics, experience, and achievements that you believe will correspond with success in this sales role. Many of these characteristics will flow from your own experience doing sales for the company. How long is the sales cycle? Who is the buyer? What benchmarks or metrics are important? Take this experience and define a candidate profile. 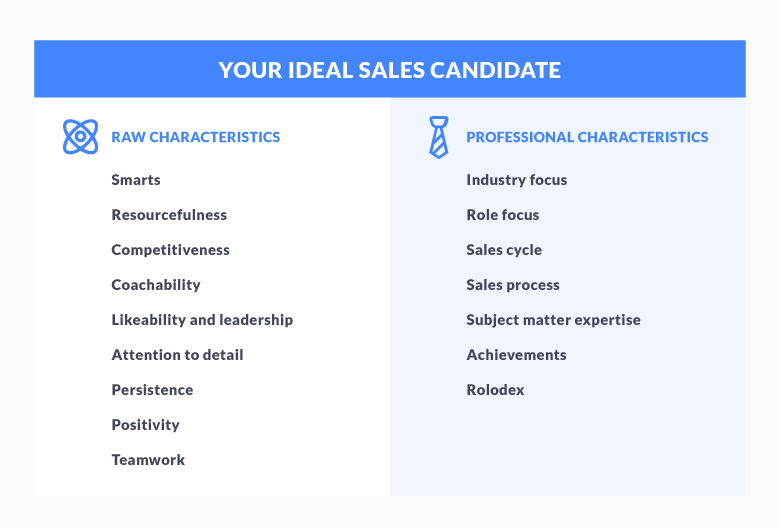 In an article for First Round Capital, TalentBin co-founder Peter Kazanjy explains how to break down the specific characteristics you want to use in order to screen candidates for sales positions. He categorizes these characteristics into two main buckets. Like most roles, there are many characteristics in a great salesperson that are difficult to teach or learn. They often only come from experience or they’re hardwired. These are the raw characteristics. They are often things you won’t find on a resume, but can be vital to a candidate’s success in the role you’re looking to fill. You’ll need to implement specific screening processes, interview questions, or other ways for assessing each candidate on these factors. Secondly, professional characteristics are what you’re likely to see on the resume. Things like industry and team experience, past roles, achievements, and skills or knowledge. Depending on your market, you may need to focus heavily on these aspects in order to find the right fit. If you’re selling enterprise software to CTOs, it may be a far leap for someone who has a background selling lawn care products to retirees (even if they did crush their sales numbers). Create a list of which characteristics are important and then rank them according to priority. For an early sales hire, you may be looking for a candidate who has less work experience but tons of raw talent and drive. These candidates are usually easier to coach and can often adapt to your sales process, even if it continues to evolve. There’s no single best way to find talented salespeople and most companies employ a number of tactics and strategies to try to find and recruit the right talent. Keep in mind that other companies are out there looking for salespeople and those who are most successful at the role are probably not actively seeking new opportunities (assuming they are being compensated adequately). But with the right mix, you can begin to create a pipeline of candidates who may be the right fit and then filter your search based on your needs. Here are some approaches to try. One of the most common ways for companies to find talent is to rely on a third-party agency to help them fill their needed seats. This can be a benefit to startup founders who are busy and inexperienced at recruitment. But it’s not the right solution for every business. Just like any kind of outsourcing, you miss the opportunity to bring valuable experience into your organization by hiring someone else to do it. Plus, your incentives may not always align with the incentives of the staffing agency. And, of course, this is likely the most expensive option and may not be feasible for an early-stage startup without much revenue. Referrals are an excellent way to find talent for your startup. But they can be a bit unreliable. In addition, there can be some social pressure to hire a candidate who isn’t the best fit but may have some connection to your team. As discussed above, making a wrong hire can be deadly, so it’s important to be extremely judicious about vetting and screening referral candidates just as you would candidates from other sources. Potentially offer a reward to team members who make a referral that is eventually hired to increase the incentive for your team to help recruit the best talent. Even so, this is a low-effort way to fill your early pipeline. If you have a strong up-front screening process, it should require minimal time and effort. It’s often a worthwhile place to start your search, even if it doesn’t ultimately produce the right candidate. Probably the most popular and effective way for finding and hiring top sales talent for your startup is direct recruiting. This means hitting the pavement (maybe literally, but probably figuratively) and going out to find candidates who you think are the best fit. Usually this just involves sifting through profiles on LinkedIn and finding the right experience and skills. Then, making contact. The obvious downside here is that it’s time consuming and can be frustrating. By the very nature of recruiting directly, you are trying to convince someone to quit their current job when they probably weren’t actively seeking a new opportunity. But it might be just what you need to do in order to find the perfect salesperson for your team. Don’t be discouraged if you try one of these methods and don’t have any luck. You may need to explore multiple channels for finding the right candidates and bringing them into your pipeline. One of the most important parts of hiring your first salesperson is to begin to define your hiring process for sales roles. It’s tempting to put this off until later--after all, you’re only hiring one person at the moment--but that would be a huge mistake. It’s easy to overlook or forget certain aspects of your hiring process if it’s not well defined and clearly documented. This part may require some trial and error. You’ll want to test your process out, judge the outcomes, and document any changes or tweaks that could make the process easier in the future. For example, if you create a process for hiring your first salesperson but you find that you’re spending too much time doing interviews with candidates that are not a good fit, then you’ll know that you should adjust your written or phone screening process in order to more quickly narrow down the pool of applicants. As your team grows, you can also get feedback to continue to improve the screening and hiring process. Expect it to change as you grow and learn. One of the most difficult parts of the hiring process for many startup founders is interviewing candidates. First of all, interviewing can be time intensive and There is often a lot at stake during this single conversation that may only last an hour or two. If you’ve successfully screened applicants before setting up an interview, then you should already have most of the basics out of the way. You should understand the candidate’s background, their achievements, and their professional experience. Use your interview to learn more about the soft skills (“raw characteristics” from up above). These are the intangibles that aren’t easy to glean from looking at a resume or exchanging emails. Put together a list of questions that gets the candidate to speak openly about their experience and gives you a chance to evaluate their style and communication skills. Why do customers buy your product? What are the alternatives? Describe your customer's’ buying decision process. Who approves or blocks the buying decision? What do you need to line up to close the sale? What kinds of questions do you ask your customer to find out what they need? At what point do you stop pursuing a potential customer? How do you stay current on your customers and product? As with other skills, interviewing skills come with experience. The more you talk to people, the more you’re able to cut to the chase and identify a great candidate from a poor one. The key is repetition. In the beginning, schedule more interviews than you think you need to have; really try to get a feel for all of the candidates you can. This will give you a broader sense of context to compare those vying for the job and give you a better understanding of what to expect. One key thing to keep in mind is that you should feel extremely confident in the choice that you make. Any doubt about a particular candidate should be a clear sign that they’re not the right fit--even if they meet many or most of the qualifications. Don’t rush to make an offer unless the fit is right. The competition for truly top-caliber sales talent is cutthroat. You can’t expect that every candidate will be frothing at the mouth to take the first offer you throw at them. Expect there to be other competition. Expect there to be some trepidation about joining a startup (especially if they come from a more established firm). And expect there to be some back and forth on compensation. In a way, you’re selling your startup to the candidate. So, use those chops that you learned from selling your company (you didn’t skip that step--right?) and get ready to pitch and close. 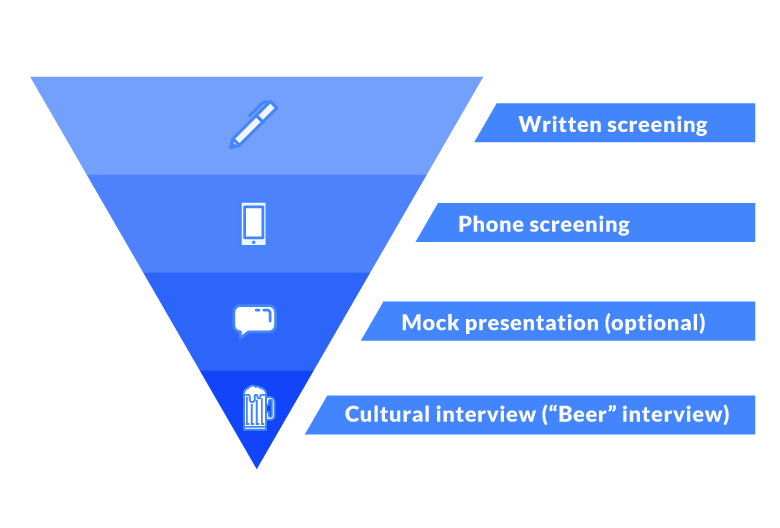 A common way to think of this part of the process is a three-stage process: Sell, screen, sell. You want to begin your process (especially if you are direct recruiting) by selling the candidate on your company and the opportunity. Then, go through the screening and interviewing process. Finally, you want to sell the candidate again on the position and on the specific offer that you’re making. Explain the factors that have gone into your specific offer and why the candidate should trust you with their career. You may not be able to match the salaries or perks of much bigger companies. But you can paint a picture for a candidate and sell them on the idea of what your company can become with them on your team. When you’re hiring, it can be tempting to put the burden onto the candidate--make them chase the position and win your favor. But, keep in mind that you have to give someone a reason to believe in what your company can offer them. As a startup founder, you should be used to selling your vision. Now, put it into action.